Total of 50 Stitches, 5 Styles of 1-Step Buttonholes, Auto Needle Threader, Speed Limit Control, Needle Up or Down Button, Soft Cover, Weighs 13 Pounds. Same as Babylock Rachel A Line BL50A machine. The Project Runway Limited Edition Innov-ís 40e. Designed with veterans and beginners in mind. Guaranteed by Brother. Introducing the Project Runway™ Limited Edition Innov-ís 40e. Unleash your creative potential with the enhanced Innov-ís 40e. Designed to appeal to skilled veterans and fashion newbies alike, this machine covers all bases. 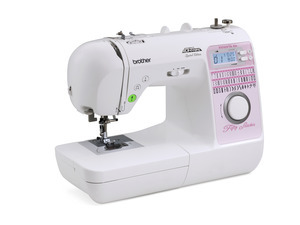 Beginning designers will find appreciation in the deluxe features - such as the free-motion stitching and Quick-Set™ bobbin, which prevents top bobbin jam, or the built-in needing threading system. Experienced sewers, on the other hand, understand that threading the machine can be a struggle for those early in their sewing destinies. This problem is a thing of the past with the Innov-ís 40e, which takes over the threading for you! Focus on your end product, and let the machine take care of the fidgety details. The Innov-ís 40e delivers convenience and comes with a wide variety of decorative stitches. Built by Brother™, and powered by your imagination. Dream it, then do it. Machine Dimensions (H x W x D): 17.32" x 7.87" x 11"
Shipping Dimensions (H x W x D): 21.65" x 11.02" x 15"
From the Brother™ Project Runway Product Lineup, the Innov-is 40 Sewing Machine is perfect for you. Whether you're new to fashion sewing or a skilled veteran of the fitting room, you'll love the creative potential the Innov-ís 40 brings to your design table. Beginners will appreciate the free-motion stitching and quick-set bobbin which prevents top bobbin jam. It also has a built-in automatic needle threading system. As any experienced sewer knows, threading the sewing machine can be a struggle for beginners. With this sewing machine, that job is done for you so you can focus on what really matters in your sewing adventures! Dream it, then do it with the Innov-ís 40's wide array of decorative stitches and convenient machine features. Made by Brother, powered by your imagination! With a variety of models to choose from, the Project Runway Limited Edition line from Brother® gives you the tools to add style to your wardrobe with advanced features such as automatic buttonholes, a wide variety of built-in stitches, seven-point feed dogs and much more. Whether you decide to work with a sewing machine, a sewing and embroidery combo machine, or an exclusive Project Runway serger, your creative possibilities will be nearly endless! Whichever model suits you best, you'll be well on your way to making a bold fashion statement.